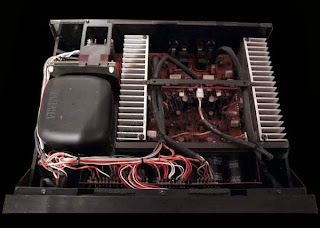 Recycled Stereo Plus: Yamaha M-50 Natural sound power amplifier. Yamaha M-50 Natural sound power amplifier. Her, at last, ia a power amplifier output stage that actually adds no distortion to the music signal. Although the actual technology involved in the Zero Distortion Rule amplifier is quite sophisticated, the basic principle of this incredible high-accuracy amplifier is quite simple. Essentially the Zero Distortion Rule system consists of a distortion detector and a summer. The distortion detector derives a signal corresponding to any distortion products originating in the amplifier itself, and the summer adds this signal back into the original audio/distortion signal - out of phase with the original signal. This effectively cancels the distortion signal, leaving the audio signal intact and virtually distortion-free. Negative feedback is the most commonly used means for reducing distortion in audio amplifiers. The amount of distortion reduction, however , is directly controlled by the amount of feedback applied. This means that in order to reduce distortion to zero, infinite feedback must be appliedd. Obviously, it is physically impossible to create infinite negative feedback, and therefore also impossible to achieve zero distortion by this method,. Increasing application of negative feedback can only approach the zero distortion ideal, while ZDR actually permits crossing the zero distortion line and creating negative distortion, making it theoretically possible to completely eliminate distortion. The feed forward system of distortion reduction attemps to cancel distortion by adding an inverted distortion signal to the audio signal to the audio signal at the amplifier's output where signal power levels are high. This means that expensive, high-power feed forward circuitry is required, and overall power efficiency is extremely low. Also, the high-power feed forward amplifier required can actually add unwanted distortion. Zero Distortion Rule performs its distortion cancellation ata the amplifier's inputs thereby eliminating the power problem. And since the ZDR circuit is essentially concerned only with low-level signal, it cannot add any distortion of its own. Another feature of the M-50 power stage is its Linear Transfer Bias circuitry. This unique bias syatem minimizes crossover distortion due to non-uniform linearity between the power transistors in a push-pull power stage. By applying precisely calibrated bias to each transitor in the M-50's cascoded push-pull power circuit and thereby staggering the operating point of each, a perfectly linear composite transfer characteristic is achieved, ensuring negligible crossover distortion levels. The unbeatable combination of the Linear Transfer Bias circuit and Zero Distortion Rule amplifier design results in outstanding low-distortion power performance and incredibly natural source reproduction.